E-design is a relatively new service offered in the interior design industry. It's not something a lot of people are familiar with. In a previous post I explained what e-design was, how it worked, and why it's a beneficial service. Now I want to talk about the most important part of e-design, the storyboard. Most people probably have no idea what a storyboard is. A storyboard, or sometimes also referred to as a design board of a vision board, is what I create custom for each client. The storyboard will have the complete design vision for your room. On the storyboard may be furniture, window treatments, rugs, and accessories depending on which storyboard option you choose. 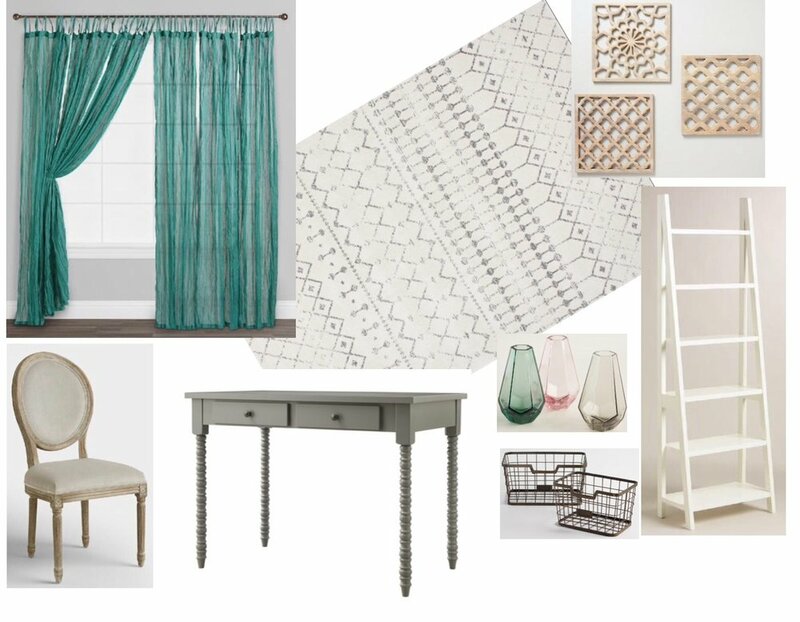 The options include Room Refresh (furniture, window treatments and accessories), Complete Redesign (everything included in Room Refresh plus wall colors), and A La Carte (accessories or color palette). This first storyboard is an example of a Room Refresh option. For this office I have picked out furniture, curtains, a rug, and accessories. This next storyboard is an example of the Complete Redesign option. On this board you see furniture, a rug, curtains, wall color, and accessories. The storyboard is to help you visualize what your room will look like. It's hard sometimes to see a rug and curtains separately and try to visualize what they will look like in the same room. Having all the pieces together on the board makes it easier to see how the room will look and how all the items will tie together. Each storyboard is created with the client in mind. I think about their own personal style and preferences, how the room will be used, and different needs they have for the room. If you need a family room to be kid friendly I won't pick out a bright white couch that is basically asking for stains. Instead I may choose a dark grey sectional and furniture with extra storage for toys. Each storyboard is designed with you in mind. I hope this helped you better understand what a storyboard is. If you have any questions about storyboards or e-design in general please feel free to comment below or ask me on the "contact me" page of my website.